The Ferracute Machine Company was founded by American Inventor and industrialist and inventor Oberlin Smith in 1863. Established in the town of Bridgeton, New Jersey, the company was in existence for 105 years until 1968. Initially, the company functioned as a supplier for the manufacturers of tin cans. But by 1891, the company had expanded and offered a full line of industrial manufacturing machinery for canneries. As the company evolved, it established itself as a leader in metal-forming press technologies. These technologies proved vital for American industry, as it enabled assembly-lines to manufacture the ever-increasing demand for consumer goods. Such goods included bicycle parts, phonographs, adding machines, and automobiles. Ferracute’s customers included Kodak, the Ford Motor Company and later, as the 20th century commenced, customers expanded and included Packard, Chrysler, Pierce, and Cadillac. Interestingly, in addition, Oberlin’s company was also involved in coin presses and was regarded as an important supplier of minting machinery. In 1898 Oberlin’s coin presses were installed at the three Imperial Chinese Mints in existence at the time. The United States Mint was also a customer. Oberlin Smith is not a household name, yet he was a contemporary of Thomas Edison and Alexander Graham Bell. And like those other two inventors, Smith was a genius who was decades ahead of his time. While Edison and Bell experimented on their phonograph and voice transmission devices, Oberlin Smith engineered a way to record sounds using magnetism. And while Edison’s phonograph was electro-mechanical, and subject to sound distortions, Smith’s was not, as his was purely electrical. Without Smith’s breakthrough, later technological innovations such as tape recorders and video cassette recorders would not have been possible. More importantly, the computers that we use today, and the concept of ‘memory’ that every computer uses in order to function, can be directly linked back to the same electromagnetic concepts of Smith’s invention. In 1937 the Ferracute Machine Company was sold to George E. Bass, after which time Bass modernized the Ferracute plants. 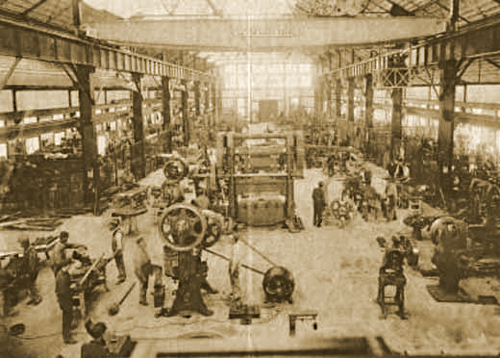 During World War II, the company was contracted by the Franklin Arsenal in Philadelphia to aid in the development of shell casings and airplane components. Other customers during the World War II included the United Kingdom and the Soviet Union. Shortly after World War II the company unionized, and post-war times were not good for the Ferracute Machine Company. As time passed the company progressively lost market share, until business could proceed no more. In 1968 its assets and rights were sold to the Fulton Iron Works of St. Louis Missouri. After the sale, the New Jersey campus was closed and abandoned. Sadly, though efforts have been made over the years to sell the complex and the old Ferracute plant to new investors, the former company’s buildings and grounds remain abandoned to this day. Pictured below are five Ferracute Machine Company tokens. The first token was struck in 1879 for exhibition at the Pennsylvania State Fair in Philadelphia. As an exhibition piece, the token was struck to demonstrate the quality of Oberlin Smith’s coining presses. Struck in copper, it is cataloged as NJ-Brg-3 and is 19mm in diameter. It grades at Extra Fine Details. The second token was struck in 1892. Cataloged as NJ-Brg-3, it was also struck as a demonstration piece. Struck in bronze, the token is 19mm in diameter. The third token was made at the Paris Internationale Exposition in 1900. As with the first two pieces, this token was also struck as a demonstration piece, using a later version of Oberlin Smith’s coining presses. Also struck in brass, the token is cataloged as Rulau NJ-Brg-4, and is 19mm in diameter. The fourth token below, NJ-Brg-5, has an obverse device that is a peacock, while the reverse is a cowboy on a bucking bronco. Why these devices were chosen is a mystery — but the token certainly deviates from the previous three designs — or all of the other Ferracute Machine Company tokens for that matter. As with the second and third pieces above, it was also struck in brass. Graded at Choice Fine, the grade is only an estimate, as it is clear the dies for this token were handmade, and thus quite crude. This variety is 22mm in diameter. It is the only example that has been seen on the numismatic auction market for the last 3 years. The fifth token below, NJ-Brg-6, has an obverse with two pug dogs, and like NJ-Brg-4, has a reverse image featuring Ferracute’s coining press. The token possesses a net grade of Very Fine, and is the largest of the Ferrucute token pieces. It measures 38mm in diameter. Despite these example specimens’ appearances, all do not necessarily reflect on the quality of the coining machinery that Ferracute produced.